Today's card shows the face of high expectations, a young player brimming with promise. Would he become a face of success? A team fixture for years to come? 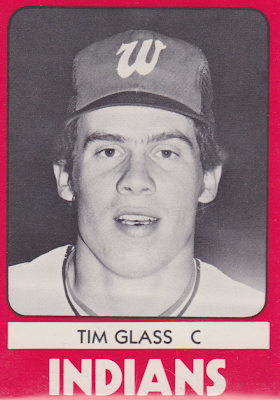 An answer to the trivia question, "who was the highest catcher chosen in 1976's amateur draft?" To at least one of those, the answer is yes. 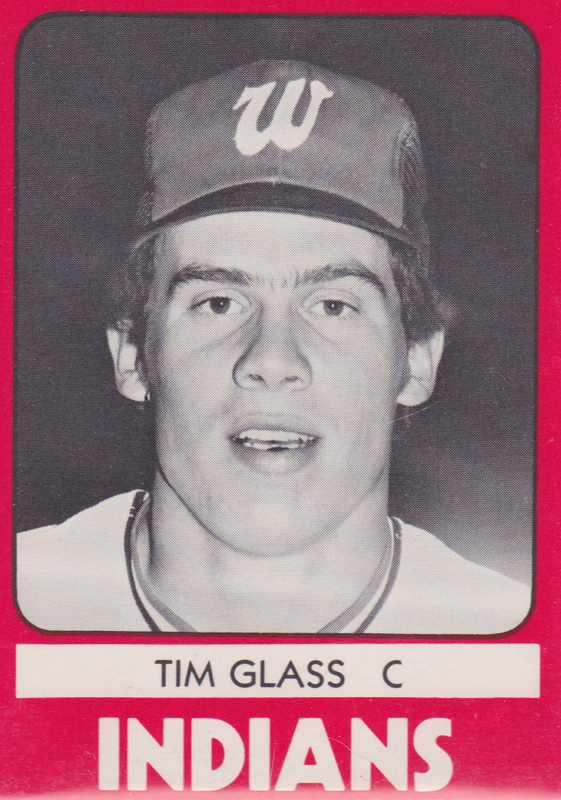 Cleveland picked high school star Tim Glass with 1976's 14th selection, making him the first of two catchers chosen in that year's first round; LA picked up Mike Scioscia five spots later. Both spent upwards of a decade with their franchises, but Mike found big-league success as everyday backstop for two World Champion Dodger teams (1981, 1988) and manager of Anaheim's only title-winner (2002). It's been 35 years since 1976, but history has a way of repeating itself. Would you believe the 2011 MLB draft class includes both Brennen Glass and Matt Scioscia, respective sons of Tim and Mike? To quote Yogi, "it's deja vu all over again." 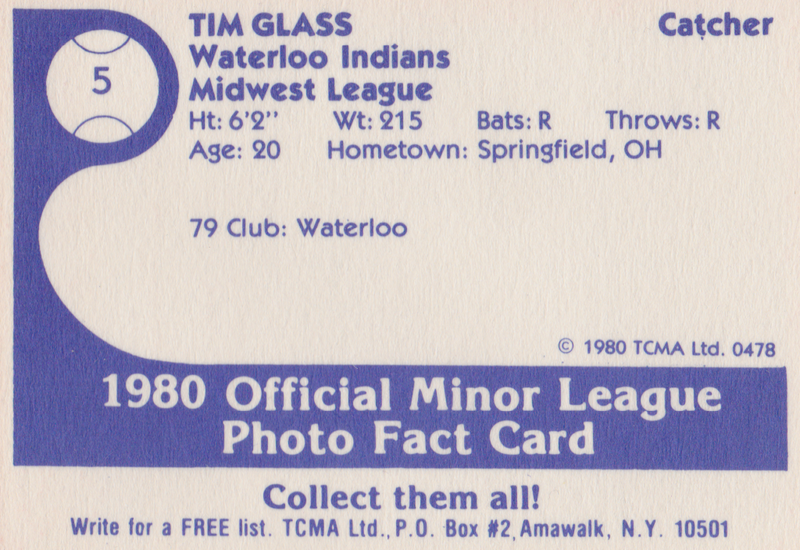 Value: Tim cost $2 on Beckett Marketplace, about the same as other 1980 TCMA singles. Some team sets use black-and-white photos, while others went with color, depending on how much the franchise wanted to spend on their cards. Fakes / reprints: Haven't seen any in the marketplace. I actually played on that 1980 team the last half of the season, but since I was a nobody most internet rosters have me as Angelo Gilbert. My name is actually Blair Gilbert and I was a 6'0"- 190 lb, R&R pitcher from Memphis State University(U of M). I am now in the Hall of Fame at Memphis. I was not drafted like Tim, but after not getting drafted, I tried out in Chatanooga after my Senior Year. (I remember Chris Bando caught me at the Lookouts old stadium during the 25 pitch tryout). Eddie Stanky (S Alabama) and Jimmy Bragan (Southern Legaue) got me that tryout! I would love to get those rosters corrected so I can show my kids and maybe grandkids someday.It was fun winning the MWL championship that year and watching Von Hayes smash helmets against the dugout. Carmello (Carmen) Castille was pretty good too. I have news clippings and a few pictures to validate my few short months there, if needed. The stats under Angelo Gilbert's name are mine. (0w-1L,2.45 era, 11 innings pitched,appeared in 4 games-thats it! Never got asked back to spring break (Clevelands mistake!) haha. Thanks!! !